June 20, 2015 – NXT Live Event: Colin Cassady and Enzo Amore defeated Chad Gable and Jason Jordan & NXT tag team champions Blake and Murphy in a 3-way non-title match. June 26, 2015 – NXT Live Event: The Vaudevillains defeated Jason Jordan and Chad Gable & NXT tag team champions Blake and Murphy in a 3-way non-title match. June 27, 2015 – NXT Live Event: The Vaudevillains defeated Jason Jordan and Chad Gable. July 9, 2015 – NXT Live Event: Chad Gable and Jason Jordan defeated Dash Wilder and Scott Dawson. July 10, 2015 – NXT Live Event: The Vaudevillains defeated Jason Jordan and Chad Gable & NXT tag team champions Blake and Murphy in a 3-way non-title match. July 11, 2015 – NXT Live Event: Aiden English defeated Chad Gable. July 16, 2015 – NXT: Jason Jordan and Chad Gable defeated Elias Sampson and Steve Cutler. July 17, 2015 – NXT: Mojo Rawley and Zack Ryder defeated Jason Jordan and Chad Gable. August 6, 2015 – NXT Live Event: Colin Cassady and Enzo Amore defeated Chad Gable and Jason Jordan. August 7, 2015 – NXT Live Event: Dash Wilder and Scott Dawson defeated Chad Gable and Jason Jordan. August 15, 2015 – NXT Live Event: Colin Cassady and Enzo Amore defeated Chad Gable and Jason Jordan. August 26, 2015 – NXT: Colin Cassady, Enzo Amore, Mojo Rawley and Zack Ryder defeated Dash Wilder, Scott Dawson, Jason Jordan and Chad Gable. August 27, 2015 – NXT Live Event: Chad Gable and Jason Jordan defeated Angelo Dawkins and Sawyer Fulton. September 2, 2015 – NXT: Jason Jordan and Chad Gable defeated Neville and Solomon Crowe in the 1st round of the tournament. September 4, 2015 – NXT Live Event: Colin Cassady, Enzo Amore, Mojo Rawley and Zack Ryder defeated Dash Wilder, Scott Dawson, Jason Jordan and Chad Gable. September 12, 2015 – NXT Live Event: Chad Gable and Jason Jordan defeated Dash Wilder and Scott Dawson. September 17, 2015 – NXT Live Event: Colin Cassady and Enzo Amore defeated Chad Gable and Jason Jordan. September 18, 2015 – NXT Live Event: Colin Cassady and Enzo Amore defeated Chad Gable and Jason Jordan & Blake and Murphy in a 3-way tag match. September 26, 2015 – NXT Live Event: Chad Gable and Jason Jordan defeated Zack Ryder and Mojo Rawley in the quarter-finals of the tournament. September 30, 2015 – NXT: Chad Gable and Jason Jordan defeated Dash Wilder and Scott Dawson in a dark match. October 2-3, 2015 – NXT Live Event: Colin Cassady and Enzo Amore defeated Chad Gable and Jason Jordan. October 7, 2015 – NXT TakeOver Respect: Baron Corbin and Rhyno defeated Chad Gable and Jason Jordan in the semi-finals. October 15, 2015 – NXT Live Event: Chad Gable and Jason Jordan defeated Blake and Murphy. October 16, 2015 – NXT Live Event: NXT tag team champions The Vaudevillains defeated Blake and Murphy, Chad Gable and Jason Jordan & Mojo Rawley and Zack Ryder in a 4-way tag team match to retain the titles. October 24, 2015 – NXT Live Event: Colin Cassady and Enzo Amore defeated Chad Gable and Jason Jordan. October 28, 2015 – NXT: Chad Gable and Jason Jordan defeated Johnny Gargano and Tommaso Ciampa. October 29, 2015 – NXT Live Event: Dash Wilder and Scott Dawson defeated Chad Gable and Jason Jordan. October 30, 2015 – NXT Live Event: Chad Gable and Jason Jordan both participated in the Halloween costume battle royal won by Bayley. 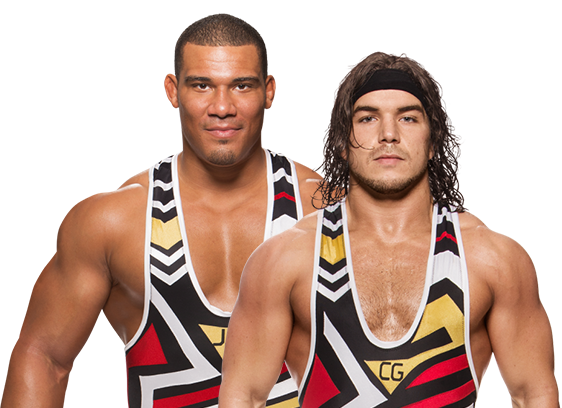 November 5, 2015 – NXT Live Event: Chad Gable and Jason Jordan defeated Marcus Louis and Sawyer Fulton. November 6, 2015 – NXT Live Event: Chad Gable and Jason Jordan) defeated WWE tag team champions Dash Wilder and Scott Dawson by disqualification. Dash & Dawson retains. November 7, 2015 – NXT Live Event: NXT tag team champions Dash Wilder and Scott Dawson defeated Blake and Murphy, The Vaudevillains and Chad Gable and Jason Jordan in a 4-way tag team match to retain the titles. November 14, 2015 – NXT Live Event: Chad Gable and Jason Jordan) defeated WWE tag team champions Dash Wilder and Scott Dawson by disqualification. Dash & Dawson retains. November 18, 2015 – NXT: Chad Gable and Jason Jordan defeated The Ascension (Konnor and Viktor). November 21, 2015 – NXT Live Event: NXT tag team champions Dash Wilder and Scott Dawson defeated Jason Jordan and Chad Gable to retain. December 2, 2015 – NXT Live Event: Chad Gable and Jason Jordan defeated The Vaudevillains (Aiden English and Simon Gotch). December 4, 2015 – NXT Live Event: Chad Gable and Jason Jordan defeated The Vaudevillains (Aiden English and Simon Gotch). December 10-12, 2015 – NXT Live Event: NXT tag team champions Dash Wilder and Scott Dawson defeated Jason Jordan and Chad Gable to retain. December 13, 2015 – NXT Live Event: Chad Gable and Jason Jordan defeated Blake and Murphy. December 14-15, 2015 – NXT Live Event: NXT tag team champions Dash Wilder and Scott Dawson defeated Jason Jordan and Chad Gable to retain. December 23, 2015 – NXT: Chad Gable and Jason Jordan defeated Blake and Murphy, Mojo Rawley and Zack Ryder & The Vaudevillains in a 4-way tag team match. January 8, 2016 – NXT Live Event: American Alpha (Chad Gable & Jason Jordan) & Apollo Crews defeated Angelo Dawkins, Dash Wilder & Scott Dawson. January 16, 2016 – NXT: Kishan Raftar defeated Chad Gable by disqualification. Jeet Rama and Kishan Raftar defeated American Alpha (Chad Gable and Jason Jordan). January 27, 2016 – NXT: American Alpha (Chad Gable and Jason Jordan) defeated Blake and Murphy. January 30, 2016 – NXT Live Event: American Alpha (Chad Gable and Jason Jordan) defeated WWE tag team champions Dash Wilder and Scott Dawson by disqualification. Dash & Dawson retains. February 4, 2016 – NXT Live Event: American Alpha (Chad Gable and Jason Jordan) defeated Blake and Murphy. February 5, 2016 – NXT Live Event: American Alpha (Chad Gable and Jason Jordan) defeated WWE tag team champions Dash Wilder and Scott Dawson by disqualification. Dash & Dawson retains. February 6, 2016 – NXT Live Event: NXT tag team champions Dash Wilder and Scott Dawson defeated Chad Gable and Jason Jordan in a best 2 out of 3 falls match to retain the titles. February 12, 2016 – NXT Live Event: Chad Gable and Jason Jordan defeated NXT tag team champions Dash Wilder and Scott Dawson in a non-title tag team match. February 17, 2016 – NXT: American Alpha (Chad Gable & Jason Jordan), Colin Cassady & Enzo Amore defeated Blake, Dash Wilder, Murphy & Scott Dawson. February 18, 2016 – NXT Live Event: Chad Gable and Jason Jordan defeated Blake and Muprhy & NXT tag team champions Dash Wilder and Scott Dawson in a non-title 3-way tag team match. February 19, 2016 – NXT Live Event: NXT tag team champions Dash Wilder and Scott Dawson vs. Jason Jordan and Chad Gable ended in a 1-1 draw, 30 minutes time limit to retain the titles. February 25, 2016 – NXT Live Event: Chad Gable and Jason Jordan defeated Blake and Murphy, Colin Cassady and Enzo Amore and The Vaudevillains in a 4-way tag team elimination match to become #1 contenders for the tag titles. February 24, 2016 – NXT: Chad Gable and Jason Jordan defeated Blake and Murphy. February 26, 2016 – NXT Live Event: NXT tag team champions Dash Wilder and Scott Dawson defeated Chad Gable and Jason Jordan to retain the titles. March 3, 2016 – NXT Live Event: NXT tag team champions Dash Wilder and Scott Dawson defeated Chad Gable and Jason Jordan to retain the titles. March 4, 2016 – NXT Live Event: American Alpha (Chad Gable and Jason Jordan) defeated The Vaudevillains (Aiden English and Simon Gotch). March 5, 2016 – WWE Experience: American Alpha (Chad Gable and Jason Jordan) defeated WWE tag team champions Dash Wilder and Scott Dawson by disqualification. Dash & Dawson retains. American Alpha (Chad Gable and Jason Jordan) defeated The Vaudevillains (Aiden English and Simon Gotch). March 6, 2016 – WWE Experience: Chad Gable defeated Riddick Moss. Chad Gable defeated Scott Dawson. March 10, 2016 – NXT Live Event: American Alpha (Chad Gable & Jason Jordan) and Finn Balor defeated Baron Corbin & The Revival (Dash Wilder and Scott Dawson). March 11, 2016 – NXT Live Event: American Alpha (Chad Gable and Jason Jordan) defeated Alexander Wolfe and Sawyer Fulton. March 16, 2016 – NXT: Chad Gable and Jason Jordan defeated The Vaudevillains to become #1 contender for the tag team titles. March 17, 2016 – NXT Live Event: NXT tag team champions Dash Wilder and Scott Dawson vs. Chad Gable and Jason Jordan ended in a double pin to retain the titles. March 18, 2016 – NXT Live Event: Chad Gable and Jason Jordan defeated Dash Wilder and Scott Dawson. March 19, 2016 – NXT Live Event: Chad Gable and Jason Jordan defeated Dash Wilder and Scott Dawson by disqualification. Dash and Dawson retains the titles. March 24, 2016 – NXT Live Event: Chad Gable and Jason Jordan defeated Alexander Wolfe and Sawyer Fulton. March 26, 2016 – NXT Live Event: Chad Gable and Jason Jordan defeated Blake and Murphy. April 1, 2016 – NXT TakeOver – Dallas: Chad Gable and Jason Jordan defeated Dash Wilder and Scott Dawson to win the tag team titles. April 3, 2016 – WrestleMania Axxess: Chad Gable and Jason Jordan defeated Dash Wilder and Scott Dawson to retain the tag team titles. April 7-9, 2016 – NXT Live Event: Chad Gable and Jason Jordan defeated Dash Wilder and Scott Dawson to retain the tag team titles. April 14, 2016 – NXT Live Event: Chad Gable and Jason Jordan defeated Sawyer Fulton and Alexander Wolfe to retain the tag team titles. April 15, 2016 – NXT Live Event: Chad Gable and Jason Jordan defeated Riddick Moss and Tino Sabbatelli to retain the titles. April 20, 2016 – NXT: Chad Gable and Jason Jordan defeated Colin Cassady and Enzo Amore in a non-title match. April 21-22, 2016 – NXT Live Event: Chad Gable and Jason Jordan defeated Dash Wilder and Scott Dawson to retain the tag team titles. April 23, 2016 – NXT Live Event: Chad Gable and Jason Jordan defeated Dash Wilder and Scott Dawson in a best 2 out of 3 falls match to retain the tag team titles. May 5-7, 2016 – Live Event: Chad Gable and Jason Jordan defeated Alexander Wolfe and Sawyer Fulton to retain the titles. May 11, 2016 – NXT: Chad Gable and Jason Jordan defeated Corey Hollis and John Skyler in a non-title match. May 12, 2016 – NXT Live Event: Chad Gable and Jason Jordan defeated Dash Wilder and Scott Dawson to retain the tag team titles. May 13, 2016 – NXT Live Event: Chad Gable and Jason Jordan defeated Tucker Knight and Tino Sabbatelli to retain the titles. May 14, 2016 – NXT Live Event: Chad Gable and Jason Jordan defeated Dash Wilder and Scott Dawson to retain the tag team titles. May 18, 2016 – NXT: Chad Gable and Jason Jordan defeated Dash Wilder and Scott Dawson in a non-title, dark match. May 20, 2016 – NXT Live Event: Chad Gable and Jason Jordan defeated Sawyer Fulton and Alexander Wolfe to retain the tag team titles. May 21, 26, 2016 – NXT Live Event: Chad Gable and Jason Jordan defeated Gzim Selmani and Sunny Dhinsa to retain the tag team titles. May 25, 2016 – NXT: Chad Gable and Jason Jordan defeated Gzim Selmani and Sunny Dhinsa in a non-title, dark match. June 2-4, 2016 – NXT Live Event: Chad Gable and Jason Jordan defeated Dash Wilder and Scott Dawson to retain the tag team titles. June 8, 2016 – NXT TakeOver – The End: The Revival (Dash Wilder and Scott Dawson) defeated American Alpha (Chad Gable and Jason Jordan) to win the tag titles. June 11, 2016 – NXT Live Event: American Alpha (Chad Gable and Jason Jordan) defeated Alexander Wolfe and Sawyer Fulton. June 12, 2016 – NXT Live Event: American Alpha (Chad Gable & Jason Jordan) & Andrade Almas defeated Bobby Roode & The Revival (Dash Wilder & Scott Dawson). June 13, 2016 – NXT Live Event: The Revival (Dash Wilder and Scott Dawson) defeated American Alpha (Chad Gable and Jason Jordan) to retain the tag titles. June 14-15, 2016 – NXT Live Event: American Alpha (Chad Gable and Jason Jordan) defeated Alexander Wolfe and Sawyer Fulton. June 16, 2016 – NXT Live Event: The Revival (Dash Wilder and Scott Dawson) defeated American Alpha (Chad Gable and Jason Jordan) to retain the tag titles. June 23, 2016 – NXT Live Event: American Alpha (Chad Gable & Jason Jordan) & Shinsuke Nakamura defeated The Authors Of Pain (Gzim Selmani & Sunny Dhinsa) & Tye Dillinger. June 30, 2016 – NXT Live Event: American Alpha (Chad Gable and Jason Jordan) defeated The Authors Of Pain (Gzim Selmani and Sunny Dhinsa). July 6, 2016 – NXT: The Revival (Dash Wilder and Scott Dawson) defeated American Alpha (Chad Gable and Jason Jordan) in a best 2 out of 3 falls to retain the NXT tag team titles. July 9, 2016 – NXT Live Event: American Alpha (Chad Gable and Jason Jordan) defeated Alexander Wolfe and Sawyer Fulton. July 14, 2016 – NXT Live Event: American Alpha (Chad Gable & Jason Jordan), Finn Balor and Shinsuke Nakamura defeated Bobby Roode, Samoa Joe & The Revival (Dash Wilder and Scott Dawson). July 15, 2016 – NXT Live Event: American Alpha (Chad Gable & Jason Jordan) and Shinsuke Nakamura defeated Samoa Joe & The Revival (Dash Wilder and Scott Dawson). July 16, 2016 – NXT Live Event: American Alpha (Chad Gable & Jason Jordan), Bayley, Finn Balor & Shinsuke Nakamura defeated Alexa Bliss, Bobby Roode, Samoa Joe & The Revival (Dash Wilder & Scott Dawson). NXT tag team champions Dash Wilder and Scott Dawson defeated Chad Gable and Jason Jordan to retain the tag team titles. July 19, 2016 – SmackDown Live: American Alpha were drafted as a tag team by Shane McMahon & Daniel Bryan to join Smackdown Live at #22. July 20, 2016 – NXT: The Authors Of Pain (Gzim Selmani and Sunny Dhinsa) defeated American Alpha (Chad Gable and Jason Jordan). August 9, 2016 – SmackDown Live: American Alpha (Chad Gable and Jason Jordan) defeated Mikey O’Shea and Mike Vega. August 23, 2016 – SmackDown Live: American Alpha (Chad Gable and Jason Jordan) defeated Breezango (Fandango and Tyler Breeze) in the 1st round. August 29, 2016 – Live Event: American Alpha (Chad Gable & Jason Jordan) & The Hype Bros (Mojo Rawley & Zack Ryder) defeated Breezango (Fandango & Tyler Breeze) & The Ascension (Konnor & Viktor). September 4, 2016 – SmackDown Live: American Alpha (Chad Gable and Jason Jordan) defeated The Usos (Jey Uso and Jimmy Uso) in the semi-finals. September 10, 2016 – Live Event: Heath Slater, Rhyno, Jason Jordan, Mojo Rawley and Zack Ryder defeated Baron Corbin, The Vaudevillains and The Ascension. September 12, 2016 – Live Event: Jason Jordan, Mojo Rawley and Zack Ryder defeated Konnor, Simon Gotch and Aiden English. September 20, 2016 – SmackDown Live: The Usos (Jey Uso and Jimmy Uso) defeated American Alpha (Chad Gable and Jason Jordan). September 24-25, 2016 – Live Event: Heath Slater and Rhyno defeated Chad Gable and Jason Jordan, Jimmy and Jey Uso & Mojo Rawley and Zack Ryder in a 4-way tag team match to retain the tag team titles. September 27, 2016 – SmackDown Live: The Ascension (Konnor & Viktor) & The Usos (Jey Uso & Jimmy Uso) defeated American Alpha (Chad Gable & Jason Jordan), Heath Slater & Rhyno. October 1-3, 8-10 2016 – Live Event: American Alpha (Chad Gable & Jason Jordan) & The Hype Bros (Mojo Rawley & Zack Ryder) defeated The Ascension (Konnor & Viktor) & The Vaudevillains (Aiden English & Simon Gotch). October 4, 2016 – SmackDown Live: Jason Jordan w Chad Gable defeated Jey Uso w Jimmy Uso. October 11, 2016 – SmackDown Live: Jimmy Uso w Jey Uso defeated Chad Gable w Jason Jordan. October 15-17, 2016 – Live Event: American Alpha (Chad Gable and Jason Jordan) defeated The Usos (Jey Uso and Jimmy Uso). October 21, 2016 – Main Event: American Alpha (Chad Gable and Jason Jordan) defeated The Ascension (Konnor and Viktor). October 22-24, 2016 – Live Event: American Alpha (Chad Gable & Jason Jordan) & The Hype Bros (Mojo Rawley and Zack Ryder) defeated The Ascension (Konnor & Viktor) & The Vaudevillains (Aiden English and Simon Gotch). October 30-31, 2016 – Live Event: Heath Slater and Rhyno defeated American Alpha (Chad Gable and Jason Jordan) & The Usos (Jey Uso and Jimmy Uso) in a 3-way tag team match to retain the tag titles. November 1, 2016 – Survivor Series: American Alpha (Chad Gable and Jason Jordan) defeated The Spirit Squad (Kenny and Mikey) to qualify for the Survivor Series SmackDown Live tag team team. November 3, 2016 – Live Event: Heath Slater and Rhyno defeated Breezedango (Fandango and Tyler Breeze), American Alpha (Chad Gable and Jason Jordan) & The Usos (Jey Uso and Jimmy Uso) in a 4-way tag team match to retain the tag titles. November 4-8, 2016 – Live Event: American Alpha (Chad Gable & Jason Jordan) and Kane defeated Randy Orton & The Wyatt Family (Bray Wyatt and Luke Harper). November 9-13, 2016 – Live Event: American Alpha (Chad Gable & Jason Jordan) and Kane defeated Randy Orton & The Wyatt Family (Bray Wyatt and Luke Harper). November 29, 2016 – SmackDown Live: Bray Wyatt and Randy Orton defeated American Alpha (Chad Gable and Jason Jordan) to become #1 contenders for the tag team titles. December 27, 2016 – SmackDown: American Alpha (Chad Gable & Jason Jordan) defeated WWE SmackDown tag team champions the Wyatt Family, the Usos, and Heath Slater & Rhyno in a Fatal 4-Way match to win the titles. December 6, 2016 – SmackDown Live: Chad Gable w Jason Jordan defeated Tyler Breeze w Fandango. December 6, 2016 – 205 Live: American Alpha (Chad Gable & Jason Jordan) and Dolph Ziggler defeated The Wyatt Family (Bray Wyatt, Luke Harper and Randy Orton) in a dark match. December 26, 2016 – Live Event: The Wyatt Family (Bray Wyatt & Randy Orton) defeated American Alpha (Chad Gable & Jason Jordan) and Breezango (Fandango & Tyler Breeze) and Heath Slater & Rhyno and The Ascension (Konnor & Viktor) and The Usos (Jey Uso & Jimmy Uso) in a tag team turmoil to retain the tag team titles. December 27, 2016 – SmackDown Live: American Alpha (Chad Gable and Jason Jordan) defeat Heath Slater and Rhyno, The Usos (Jey Uso and Jimmy Uso) & The Wyatt Family (Luke Harper and Randy Orton) in a 4-way tag team elimination match to win the tag team titles. January 7, 9, 2017 – Live Event: American Alpha (Chad Gable & Jason Jordan) and Apollo Crews defeated The Wyatt Family (Bray Wyatt, Luke Harper and Randy Orton). January 10, 2017 – SmackDown Live: SmackDown Live tag team champions American Alpha (Chad Gable and Jason Jordan) defeated The New Wyatt Family (Bray Wyatt and Randy Orton) w Luke Harper to retain the tag titles. February 14, 2017 – SmackDown Live: SmackDown Live tag team champions American Alpha (Chad Gable and Jason Jordan) defeated The Ascension (Konnor and Viktor) in a non-title match. March 14, 2017 – SmackDown Live: The Usos (Jey Uso and Jimmy Uso) defeated WWE SmackDown tag tam champions American Alpha (Chad Gable and Jason Jordan) in a non-title match. March 21, 2017 – SmackDown Live: The Usos defeated WWE SmackDown tag team champions American Alpha to win the titles. April 11, 2017 – SmackDown Live: The Usos (Jey Uso and Jimmy Uso) defeated American Alpha (Chad Gable and Jason Jordan) to retain the SmackDown Live tag team titles. April 18, 2017 – SmackDown Live: The Colons (Epico Colon and Primo Colon) defeated American Alpha (Chad Gable and Jason Jordan).